Spray plastering – also known as airless spray plastering – is one of the latest and greatest breakthroughs in plastering. It’s become the ideal solution for all your plastering needs. If you need airless spray plaster Manchester, then you’ve come to the right place. 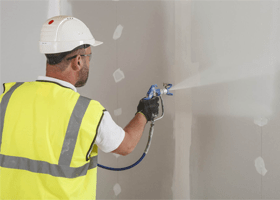 What is Airless Spray Plastering? Airless Spray Plastering presents the fastest, cleanest, and easiest way to plaster a wall. Your surfaces can go from being dry to being ready to paint in just 24 hours. There’s no need to mix this plaster beforehand and there’s barely any cleaning to be done afterwards. With this in mind, it’s obvious why Manchester spray plastering is the best choice. These spray plaster systems use a specially made fast-drying plaster compound that is applied using an airless spray gun. It’s different from traditional wet plaster in that it doesn’t need to be mixed with water. It’s all ready to be sprayed. The result is you save a lot of time with preparation, it saves you a lot of hassle, and it saves you plenty of mess. To make it better, the plaster is pure white. This means you save the time and cost of applying an undercoat. Why Use Us For Your Spray Plaster Manchester Needs? KP Ceilings offers the very best in plastering in Manchester. Of course, this includes spray plaster services. Our team are masters in every form of plastering, and this one is no different. We’ve got the knowledge and expertise you need to ensure the plaster is properly and safely applied. KP Ceilings also has connections with local manufacturers of the best kinds of airless spray foams. This means we can give you the best possible deal when it comes to price, and guarantee the quality of our work.